Meghan is one of the key Montessori people in my life. I initially purchased our Munari and Octahedron mobiles from her but it wasn't until I read her blog At Home with Montessori that my whole world changed. I never knew there was so much information about Montessori and infants. Meghan's blog and business focus on Montessori in the home with children from 0 to 3. If you have a child in this age group or are planning or expecting, you must read her blog. Have a look and you'll know what I am talking about. One of the great things about talking with Meghan is she is a parent too, with two young boys it seems she can relate in a practical way. 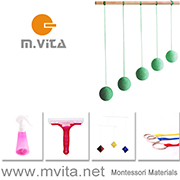 You know I love Montessori mobiles and her section on the Visual Mobile Series is the most concise there is. We also use daily the Infant's Cutlery Set and Otis has just started exploring the Egg and Cup and Palmer Grasp Cylinder Block from the Materials for Hand Development. Do you remember my post Have you ever made a Montessori Puzzle Ball, I actually tried and made one of these balls myself, my secret though, I emailed Meghan for help. Megan has kindly offered one of her puzzle balls for a giveaway. But first I asked her a few questions. Can you tell us a little about yourself and how you first became interested in the work of Montessori? I went to a Montessori school myself, in Cape Town South Africa. The experience must have been fundamentally changing for me, because all throughout the completion of my teaching degree, and subsequent teaching positions in traditional schools I never felt completely at ease. When I first found myself back in a Montessori classroom as an adult , I realized that I had found what I was missing. The Montessori approach sits so well with the way I choose to live my life in general, and complements my beliefs and understanding about how the world works and how people really are. Working in several different Montessori settings with children from birth to age 12 has been incredibly rewarding as a teacher. And being able to be the best parent that I can be for my own children has been made so much easier with the knowledge that my Montessori studies has afforded me. In short, I don't believe I could ever teach in a traditional setting again, such is the impact that Montessori has had on my approach to children and learning. Your business At Home with Montessori sells a wonderful range of products, how do you decide which products to stock? Firstly, I only stock items that we use in our own family. A huge motivation in setting up At Home With Montessori was the sad lack of beautiful well-made Montessori materials available in Australia. After searching in vain for local stuff with my first child, i decided that I would need to source materials for myself the second time around instead of having to buy from overseas companies. I sell mostly handmade items, with the infant mobiles and the fabric items made by me, and the wooden items made by a local craftsman with a passion for native Australian timbers. In short if I wouldn't use it with my own children then I would not offer it to anyone else for use with their children. You are Montessori trained, did I read that you offer a free consultation with the purchase of some products? Yes, a large part of the reason why I set up At Home With Montessori was to address the real shortage of useful and accurate information about the Montessori approach with infants and toddlers. Sadly too often families are drawn into buying ready made "curricula" for their littlest ones by unscrupulous people who really don't promote Montessori in its true form. In actual fact, Montessori is so much less about 'what' you teach than 'how' and 'why' you teach it. I try to offer families who purchase items from me ongoing support in setting up an authentic Montessori home environment for their little ones, in the hope that the more people out there who practice this way of parenting the less successful these unqualified and unscrupulous people will be at marketing Montessori as something you can do to your kids after reading a standardized manual. I offer a home environment consultation service to families where I walk through their homes (either in person or virtually) and help them to streamline and adapt their spaces to best meet the needs of their young children. This service is very personalized and requires a commitment of time and money from families and from me. But for the families who choose to purchase equipment and materials from me without wanting to make a commitment to my home environment service, I wanted to offer something helpful and useful to them as well. So I am happy to offer advice and suggestions for the implementation of the method in their homes when they purchase even the smallest item from me. Could you explain the puzzle ball and how it could be used/presented. The puzzle ball is a wonderfully versatile toy. It first sees use after the baby has outgrown the visual mobile series. Your baby will let you know that they are ready for a different kind of work when they begin to kick their legs, wave their arms and generally seem to be reaching out towards things in their environment. The puzzle ball can be suspended from an elastic strap just in reach of your baby's hands or feet. At first their contact with the ball might seem to be random and very uncontrolled. But each they make contact with the ball through their hands and feet the little feeling of mastery over the environment will be reinforced until they begin to make overt and focused attempts to touch it, kick it and even grasp it. The puzzle ball sees a second phase of use when your baby starts to explore things with two hands. The ball's unique shape makes it easy to hold on to and interesting to look at and touch. When baby is sitting up independently they love to play with you by rolling the ball back and forth between you. They delight in these sorts of reciprocal games. The balls a great for stimulating crawling since when they roll they don't go very far. They provide a well-matched challenge by offering some problem-solving opportunities "I want that ball, how am I going to get there to grab it?". And at the same time a not insurmountable difficulty "yes, yes I'm almost there! Just a little bit further!". And these wonderful toys offer a great opportunity to the walking toddler when learning how to throw, catch and kick ball - a phase my youngest child is in right now. At 13 months he practices his ball skills daily and can often be found asleep on his bed with his puzzle ball tucked up under his arm! This puzzle ball from our family to yours offers many exciting play opportunities ahead and comes in warm and cool primary and secondary colours which may present the chance to learn some colour words too! Thank you to Meghan from At Home with Montessori, the giveaway is for one handmade Puzzle Ball. To enter simply leave a comment. I will draw the giveaway using random number generator and will contact the recipient shortly after by email. Comments close Thursday 8th December at 9pm AEDT. The giveaway is open internationally but please only one entry per family. Edited 8 December. Comments have now closed. Thank you to everyone who entered. The puzzle ball will be going home to... Anna! The next giveaway will be this weekend! 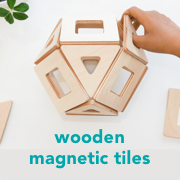 Please come back and have a look, another great giveaway item and a little about another of my favourite Montessori companies.